Bru Bar & Hostel i Cork, Irland: Bestill nå! 50% of Balance is refunded if cancelled more than 1 week prior to arrival. Full amount of balance payable if cancelled less than 1 week prior to arrival. A 10% non-refundable deposit is required to confirm the booking and cover all administration costs. Full payment is required two weeks prior to the groups arrival. To ensure correct allocation, final details are required 14 days prior to arrival. No refunds will be available if numbers reduce after this point. All group bookings are subject to availability and rates may vary in accordance with special events and Bank Holidays. A security deposit of €20.00 per person is payable for all groups of 10 person or more. This deposit is refundable upon check-out subject to there being no claim. (Please refer to Code of Conduct notice to all groups). One member of the group is to be appointed leader and is to complete Code of conduct form on arrival and will be the dedicated liaison person for the duration of the reservation . This person will be held responsible for any damage done or costs arising from breaking the code of conduct below. Groups can only book rooms in their entirety and can not part - reserve any rooms. All Hens, Stags and sports teams are to call and book directly. We only except bookings of 2 nights or more on all weekends for large groups of 10 plus persons. 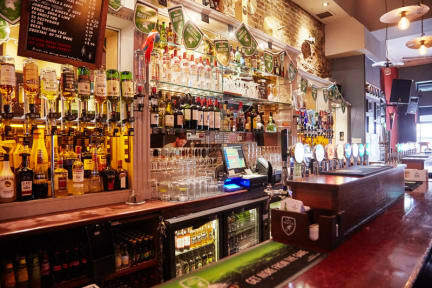 Book a few days in Bru and see what Cork has to offer. Great pubs (we have one on the ground floor! ), restaurants, festivals and 50,000 students always looking for a good time. Historical sites, famous tourist attractions and the best weather in Ireland. N.B. Brú Bar & Hostel Ltd reserves the right to take the balance of the 1st nights payment 1 day prior to arrival date. All guests get a discount on select drinks in the bar! Just present room key for offer. Closest Hostel to Bus station, Train station, Air coach/City Link drop off. Paid access to the clarion Hotel Gym Pool Sauna etc.